"THE GATEWAY TO ANOTHER WORLD"
This story, though it occurred some years ago, is nonetheless true. A by-product of the new relaxed mentality and interest was that gifted individuals, those who had psychic gifts of minimum to maximum proportions, suddenly felt comfortable talking about or even to some extent advertising themselves. They would make their services available through the bookstore and lecture circuit and were enjoying the results of the new "fad." One New Orleans woman was never a less likely devotee of the paranormal and occult, or so it seemed. A devoted Catholic who had gone to church and prayed faithfully all her life, nonetheless now fostered a new interest in the "unknown." The woman, whom we will call "Sadie" for the purposes of this story, threw herself into the paranormal with both feet and soon was attending lectures and sharing her interest with newfound friends. 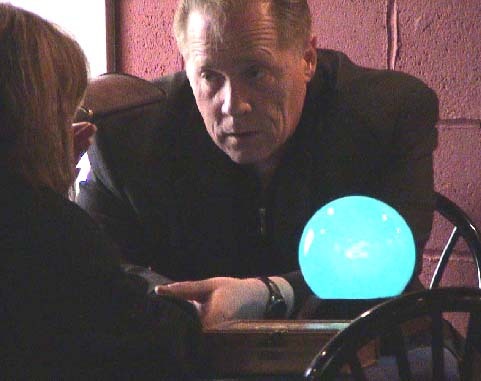 No one who has any interest in the occult and paranormal can long resist the desire to know the future, to have a psychic reading of their very own and through various channels Sadie was led to a woman whose talents and skill for reaching the "other side" had already become famous. It was easy to get appointments and the psychic was always available during the day, but not in the evening when she performed seances and trance sessions. Sadie set her appointment and ticked off the days until it arrived. In that time she had narrowed down a few questions to ask that interested her and thought about what part of the future she was most interested in. To balance her seemingly impractical side, Sadie had a predictability that was legendary among her family. Thus when she told her 14 year old daughter that she would be picking her up early from school that day it was a surprise and interested the girl very much. However one explains a visit to a psychic to a 14 year old, Sadie did this while they were en route to the psychic's house. Sadie's daughter was reluctant to go inside the house. It immediately felt uncomfortable to her. But her mother insisted, apparently thinking her more in harm's way languishing in the car as the fall afternoon wore on than inside a house where spirits came and went freely. The daughter resigned herself to accompany her mother inside. The "psychic lady" was quite normal looking, a typical New Orleans housewife with short dark hair and brown eyes; nothing spectacular but acceptably attractive. She was very nice and welcomed Sadie and her daughter eagerly into the front door. Once inside, she immediately took Sadie by the arm and led her from the foyer into the massive living room / dining room combination. Sadie's daughter, for the moment forgotten, stood rooted to the parquet floor of the entrance foyer gaping at the rooms around her. It seemed that every nook, every cranny was filled with something old. This was not the "something old" one might give a new bride; these were OLD things, antiques, and it was immediately apparent that there was a LOT of character in the room. The teen walked in step behind her mom until the psychic turned and realized she was there. "Oh, honey," she said in a drawl that only New Orleanians understand, "you're gonna have to wait up front for mom, OK?" A sinking feeling as the door to the anteroom off the psychic's very ordinary kitchen slammed in her face. The daughter made her way back to the living room and at first found a place to sit that was near the dining room table. Sadie had told her all about the seances that the lady conducted there. The teenage girl didn't know how she actually felt about sitting so near what amounted to an oversized Ouija board so she moved over to an uncomfortable Louis XVI settee that stood nearby. Soon, however, this spot came to feel just as uncomfortable, or, as she thought at the time, "exposed," so the girl moved yet again, finally settling in a comforting (at least by appearances) English wing chair directly beside the front door. As soon as she sat down, however, there came the sound of a huge CRASH from the rear room into which her mother had disappeared with the psychic. The girl moved to get up, wanting to see what the matter was, but suddenly she realized she would not move even if she wanted to: there came a sound to her ears that fixed her in place in complete panic, almost unable to move. It sounded like a rush of air at first, exactly as an air conditioning vent will sound when the central unit kicks on -- only there was no central air conditioning in this house and apparently not even a window unit anywhere nearby. The sound of rushing air seemed to emanate first from the back of the house, then grew in intensity until it filled all the room around her. Every object in the room seemed to be keenly aware of her presence now and everything, even the paintings on the walls and the rare books on the antique tables all around, seemed to perk up and join in the rushing sound until it became a hissing like a huge cat sneaking up unseen, about to lunge. As the sound grew, the young girl drew herself up into the scant comfort of the old wing chair, seemingly the only thing in the room that was not whispering to itself, to its neighbors or to her. She drew her knees up against her chest and covered them with the folds of her Catholic girls' school skirt, and listened and watched as the unseen tornado swirled around the room. Faintly there came the sounds of voices and at this the teenager began to come unhinged. She looked over her shoulder at the front door, one of those Florida style affairs with the glass slats that open by way of a rolling handle to one side: the deadbolts on the door looked impossible to open. The girl was now completely frightened and thought she was about to scream if the noise did not stop when suddenly there came a loud "CLANG" followed by a scrape and a loud "SLAP." The room fell completely silent, but she had already jumped to her feet and spun round to face the sound when she saw the shadow of the postman pass in the front window. She looked at the floor in front of the door and saw a few pieces of mail laying there. Suddenly she was aware of street sounds outside and the sound of birds in the huge cedar trees on the lawn. With a sigh of relief the girl sank into the chair again. But she was still wary, and soon the silence became more watchful and more deafening than the hissing tornado of moments before. Finally thinking she would lose her mind, the girl was relieved to hear the door to the back room open and to see her mother and the psychic walking toward the front of the house. Not surprisingly when the psychic unbolted the front door, Sadie's daughter was the first out into the open air. The psychic looked at her a little puzzled and then nodded almost knowingly. The daughter was already leaning on the car door, anxious to get inside. With some polite "goodbyes" Sadie finally got into the car and began to drive away. "Mom," asked the teen, "what was that banging noise I heard after you went in the back?" Sadie, reluctantly, admitted that the noise had come from the back room and related that as soon as she had sat down in the darkened room and the psychic had set a match to two candles on a coffee table, there was a banging on the window, "from the outside." It was so intense it shook down a porcelain figure that the psychic had on the windowsill. Not only this, but Sadie said she felt a bone chilling cold pass her, as if on its way out of the room, as soon as the window was struck. Sadie's daughter didn't tell her mom about the experience she had waiting on the edge of the unknown that day. If Sadie herself ever went back to visit that psychic, she never shared any news about it with her daughter. But the young girl never forgot, and a couple of years later when she was old enough to legally drive, she and the very bravest of her girlfriends would go "cruising" in the Lakeview area and try as she might, Sadie's daughter never, EVER could find that house again, though she knew exactly what street it was on and where it stood in relation to the rival Catholic school nearby. Years of trying turned up nothing, nothing that is except an empty lot where the house ought to have been .... maybe she just wasn't meant to find it again? Soon, however, Sadie's daughter would have her own and worse experiences with poltergeists and hauntings in her own suburban New Orleans home, and these experiences would sometimes diminish but never eclipse this first brush with the unknown in the house that "wasn't there." NOTE: This is a true story. It is neither Urban Legend nor local myth, but actually happened to the author. Names have been changed to protect the privacy of the contributor, but the veracity of the events is without question. And the house still can't be found. E-mail Haunted America Tours for inclusion in a future article or story archives.